I made this guy today. I call him Benny. His right arm comes off, because we are going to play Pin the Arm on the Skeleton with him on Saturday. 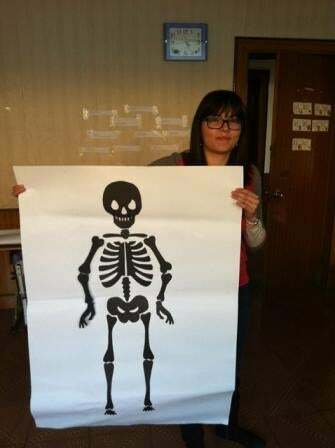 I'm teaching English in China right now, and I decided to organize a Halloween party for the kids at our school, both to introduce some western customs to them (which fascinate them), and to relieve some of my home-sickness. From this, Benny was born. The plan is to teach the kids to trick-or-treat, organize a bunch of activity stations (mask-making, bobbing for apples, pin the arm on the skeleton), have a few group activities and a costume contest at the end. I'm really nervous, but also really excited. If you want to make your own Benny, you can print out the templates here. So, what are you guys planning for Halloween? Any cool classroom activities you can recommend?